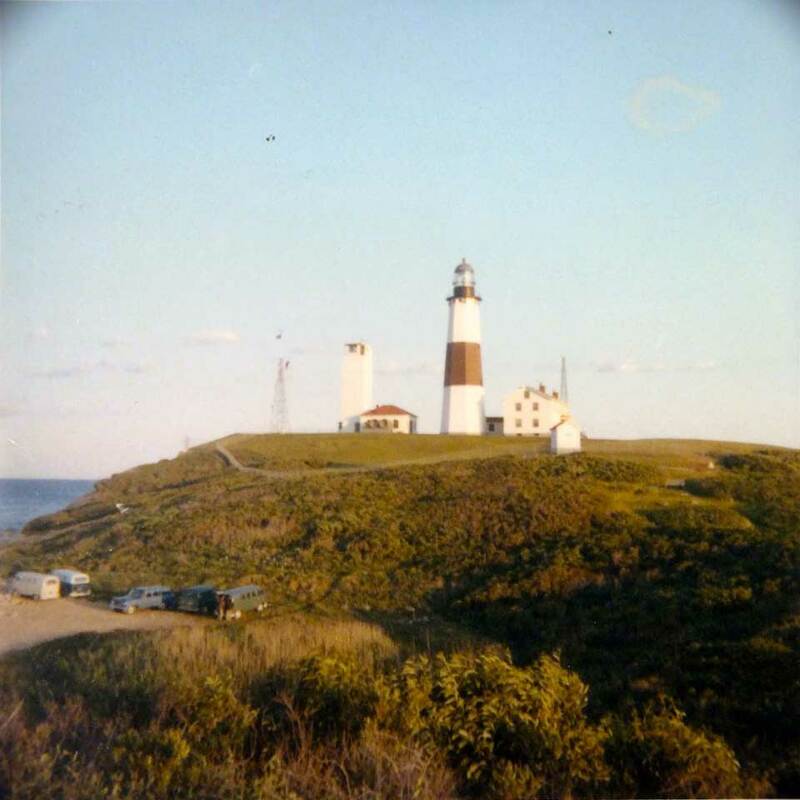 Montauk Point Lighthouse, mid-late 1960s. We used to park under the light right in front of Scott’s Hole. There was a path we could walk to get out to the flat rock. Most people don’t know this, but there’s a big rock right off the front of the Montauk Point Lighthouse at about 200 feet that’s flat and has room for two people to fish. Back in the late to mid 1960’s, when the lighthouse was in its original form, before they added the erosion control measures, you could walk around the whole light. At a good low tide, there’d be 15-20 feet of sand that you could walk out on and get out closer to that rock. Well, it was accessible only at the very end of the outgoing and the beginning of the incoming and you had to be absolutely careful of the time of the tide. If you weren’t, it was very easy to get knocked off and swept away. You basically had one to one and a half hours of fishing before you had to leave. It was crazy, but it gave you an extra 200 ft to get into the rip and so it was pretty good even in the daytime. If you did get a bunch, it was really difficult to get back to the beach when the tide started to run because even though the tide was coming in, if you waited too long, you really couldn’t get to the beach because it would pull you out. It was a long pull to get back if you had fish on a stringer. We fished that rock only in the day because it was actually pretty scary. In that time, there were only a few guys who fished there. One of them was Whitey Polaski. And Greg Osenick was one of the guys that fished that rock too. Sometimes Marvin Wollman would come out with me. Marvin was a lightweight guy and would get knocked off pretty easily and I would pull him back up. We’d keep on fishing and he’d keep on getting knocked off. It would happen a few times and then after a while we’d both leave the rock because it was just too much with the waves getting too big. Most of the guys would stay away from Marvin because he was clumsy and terrible at fishing, but Greg and I would fish with him because he loved fishing Montauk and he was quite the character. After he retired, he drowned in 1991 or 1992 while fishing around False Bar using waders. Jack Yee found him right at the surf. He was my fishing buddy and our family friend and I still miss him after all these years. We all mostly used waders and the risk factor was pretty high. Using them to get to the rock was borderline crazy. This was in the time before wetsuits. Fishing was harder and you couldn’t cast as far and you only had 20 lb. pink Ande. It was also before the era of bucktails, so 90% of the daytime fishing was done with poppers or tin. We used Luxor Reels and Lamiglas 1165 Supercutters (Honeysticks). We didn’t have any kind of studded boots or shoes or Korkers. All we did was buy felt and glue it onto the soles of our waders. That’s it, no studs. Things were slippery all the time, but we did good. Slipping wasn’t a big issue when when we were 25-30 years old, we just kept on getting back up. That rock is barely visible today even at at low tide, so very few people even know the it’s there. With the changes to the lighthouse and how mother nature has changed the ocean floor, there’s more water in front of the light than there used to be so you can’t even get there anymore. It was pretty crazy and scary, and we took all kinds of risks and had makeshift equipment, but man, did we catch some fish! Marvin Wollman, 1969. He drowned while fishing near False Bar in 1991. He was my fishing buddy and our family friend. We still miss him to this day. Great story ,I would have definitely been on that rock I was always taking risk especially if it’s something that I love to do and fishing is . We’ve have a house in montauk for 60yrs now, my dad. Nick the barber fished off those rocks for years.he used to sleep in his car, thats when he decided to build a house by ditch plains…huge bass hanging on his hip!